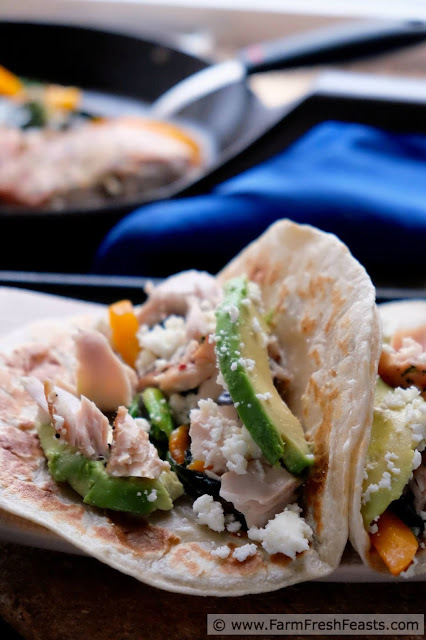 Flakes of seasoned fish nestled against sautéed bok choy and peppers in a warm tortilla, topped with avocado slices and crumbled queso. 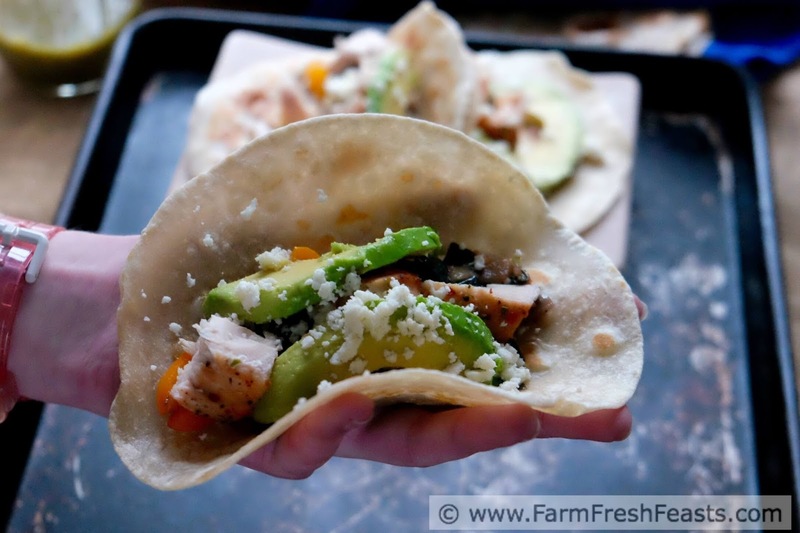 Use the farm share in unexpected ways with these tacos. One of the ways I use less familiar produce in our farm share boxes is to tuck it in alongside other, more familiar to my family, foods. This tip the first one of my Five Tips to Feed Your Family From the Farm Share. When I picked up some marked down pre-seasoned mahi mahi, I thought it would go nicely with the dark purple bok choy from the Community Supported Agriculture (CSA) farm share in a fish taco. 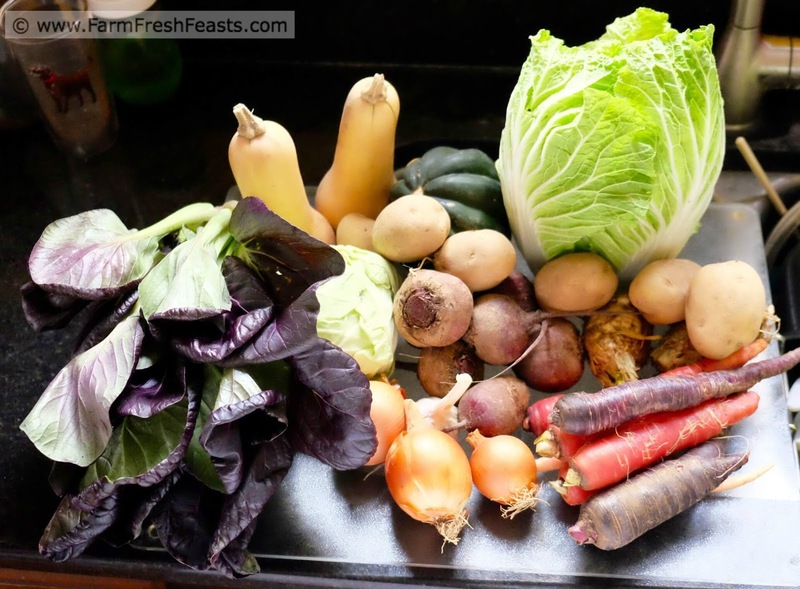 A typical late Fall farm share box. Bok choy is a pretty terrific workhorse in a typical cool season [late Spring or Fall, like the photo above shows] farm share box. The mild flavor of this dark leafy green is great in Asian-inspired meals (like this Fried Rice with Greens and Chicken), it's quick in a pasta dish (like this Fast & Easy Greens & Pasta concept recipe), and can usually be substituted for spinach or Swiss chard just about anywhere. I like to separate the thick stems from the leaves first. I chop the stems to sauté with onions and peppers, then add the leaves at the end to wilt slightly. Depending on your choice of seasoning, you could go a number of different directions with bok choy. Or you could keep the focus purely on the bok choy, as with Alanna's Bok Choy Salad with Homemade Creamy Vinaigrette. Your kitchen, your call. 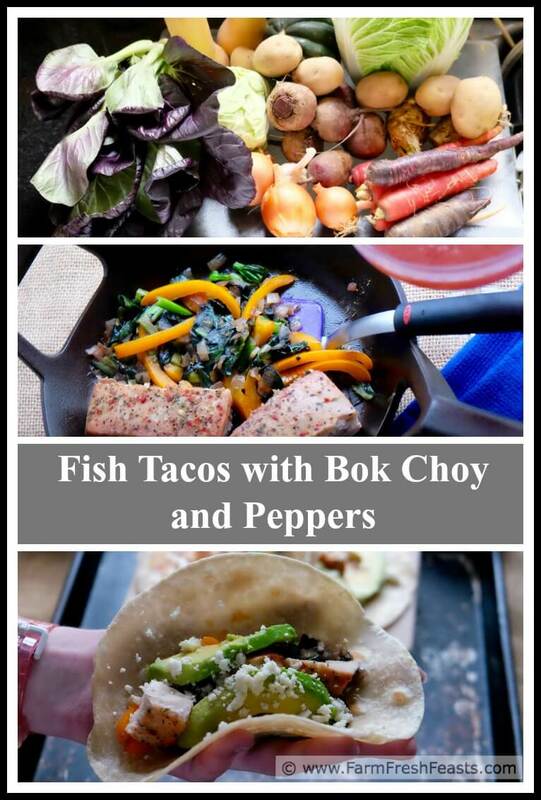 Here's one way I used purple bok choy from the farm share in my kitchen. For more recipes using bok choy, please see my Bok Choy Recipes Collection. For more recipes using bell peppers, please see my Pepper Recipes Collection. These are part of the Visual Recipe Index by Ingredient, a resource for folks like me eating from the farm share, the farmer's market, the garden, the neighbor's garden, and great deals on ugly produce at the grocery store. Note: I used a pre-packed seasoned fish fillet for these tacos. The mark down sticker in the fresh seafood case caught my eye. 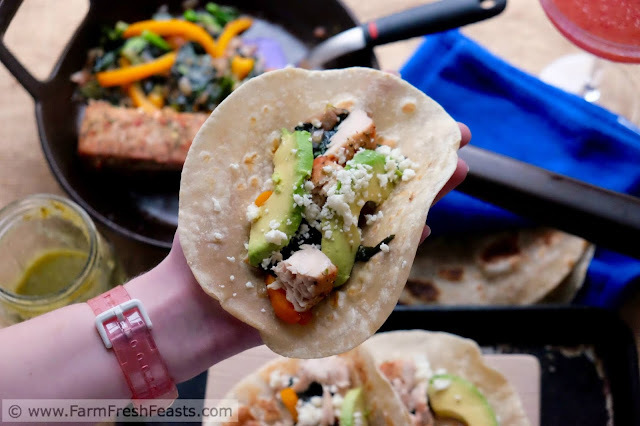 You could use fresh fish that you season yourself, or a box of frozen seasoned fish fillets, for the protein in these tacos. You could bake the fish as I did, or grill it if you prefer. Preheat oven to 375 degrees Fahrenheit. Place seasoned fish on a parchment paper-lined rimmed baking sheet (for easy removal and cleanup, no fat needed) and bake for 20 to 25 minutes until the fish flakes lightly with a fork. 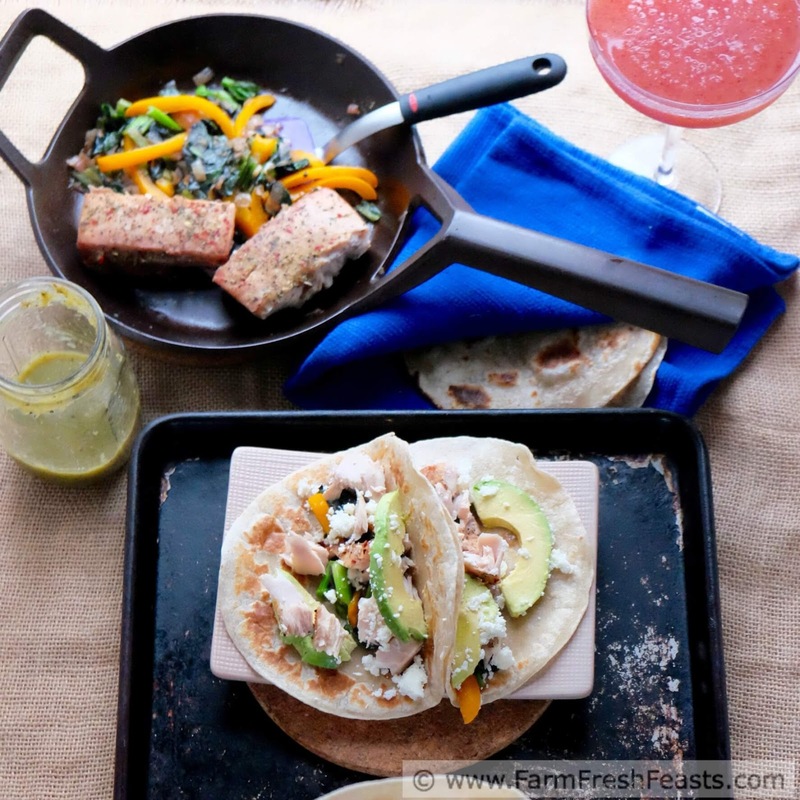 While the fish is cooking, cook the tortillas and vegetables. In a large hot dry skillet over medium high heat, cook raw tortillas according to package directions. Wrap each one in a clean dishtowel to keep warm and soft. Set aside. 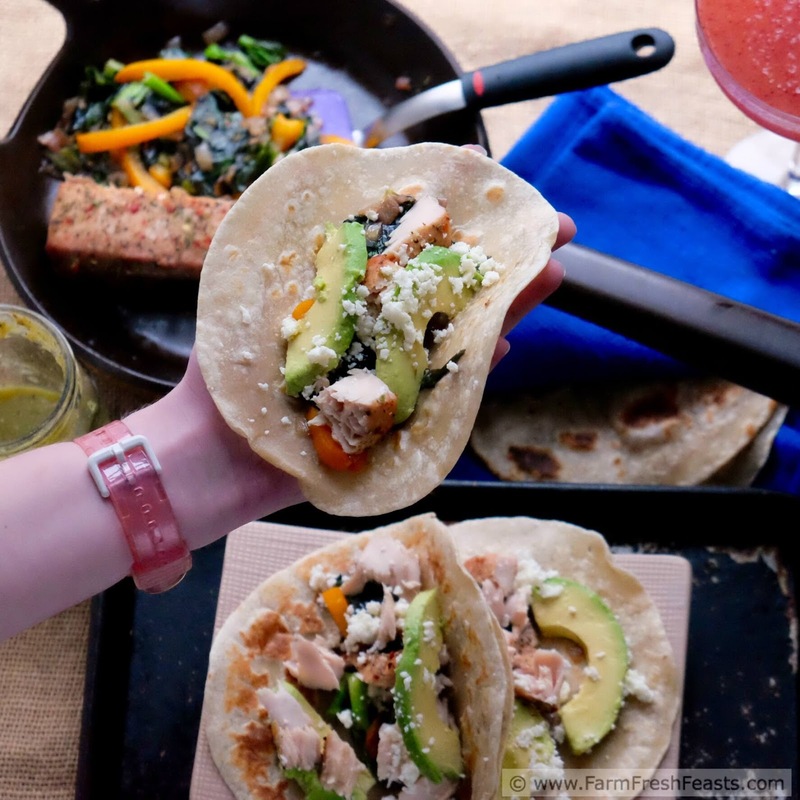 (If you're using pre-cooked tortillas, warm them gently according to package directions, wrap in a clean dish towel, and set aside. Separate stems from leaves of the bok choy. Chop the stems the same size as your onion. Slice the leaves into ribbons and set aside. 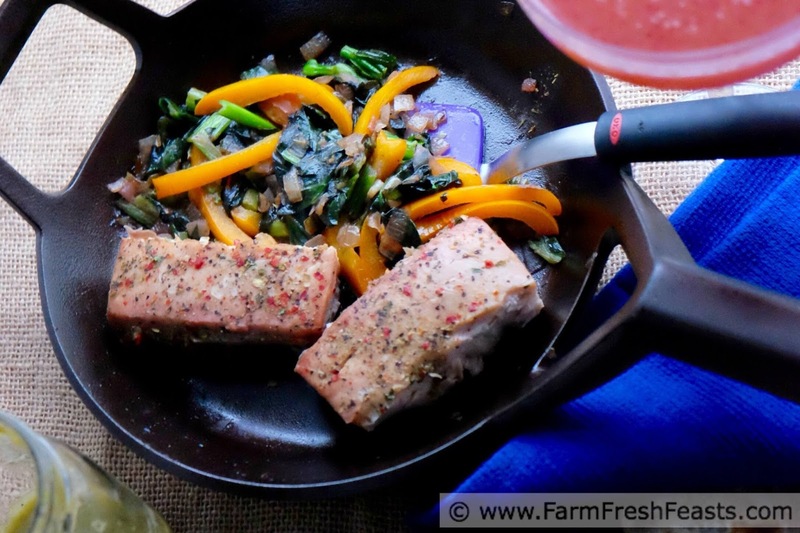 Preheat a large skillet over medium heat. Add olive oil. When the oil is shimmery, add the bok choy stems and onions to the skillet. Stir to coat with fat. Cook, stirring occasionally, for 5 minutes. Add in the peppers, stir to coat with fat, and cook another 5 minutes until the vegetables are tender. Season with a pinch of salt and several grinds of pepper. Toss the bok choy leaves on top, stir to combine with the other vegetables, and turn off the heat. The leaves will wilt from the residual heat from the skillet. Stir in the salsa verde to the wilted vegetables in the skillet. 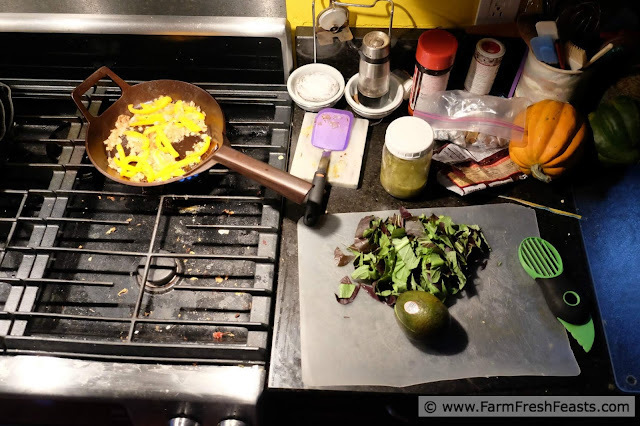 To serve, mentally divide each component (the skillet of vegetables, the fish, the avocado and the cheese) into eighths--or divvy it up physically into 8 piles each, your choice. Place a portion of vegetables in a warm tortilla, top with a portion of fish, avocado, and cheese. If you like, more green salsa would be lovely with this. Enjoy bok choy!